Know your platform (operating system). For Androids, continue on to steps 2 and 3 to complete your install; for iPhones, iPods, and iPads, skip steps 2 and 3 and continue from step 4 to “get” the application on iOS. Android users: perform an Android app search. Simply launch the Google Play Store application from your device. In the green section at the top of the screen is an icon of a magnifying glass. 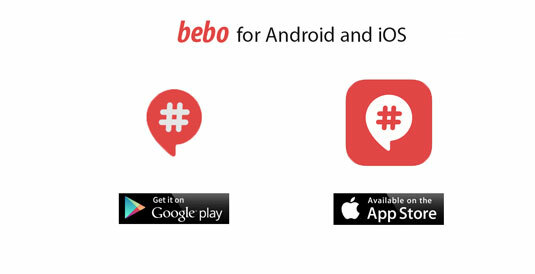 Tap the magnifying glass icon and type Bebo when the on-screen keyboard pops up. A list of applications will show up. Typically, the first one in the search results will be the application you are looking for. Locate the application and continue to step 3. Android users: install the app on Android phones and tablets. To install the application to your device after it has been found, just tap the small box next to the app’s description that says Install. A window will pop up that asks you to accept the permissions for the application’s use of the different features built into your tablet or smartphone (for example, the camera and microphone). For Android users, that is all you have to do to install this application. Since Bebo is available for free, no additional steps are required. When finished, go back to the device’s home screen, launch the app, and enjoy! 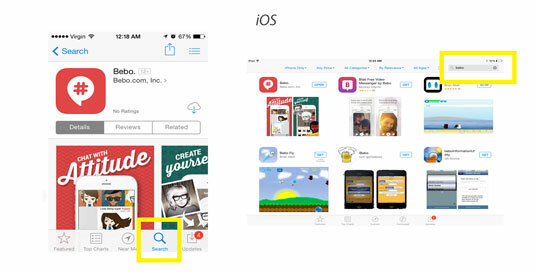 iPhone, iPod, and iPad users: perform an iOS app search. 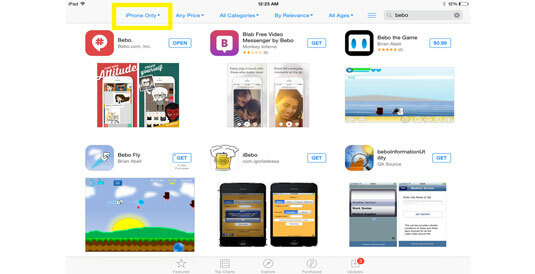 Launch the Apple App Store from an iPhone, iPod, or iPad and locate the search icon within the App Store application. 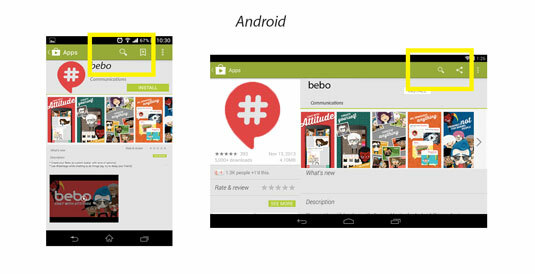 Tap on the search icon, and type Bebo or Bebo Inc. The first search result will be the application you are looking for, unless you are using an iPad. iPad users should continue on to step 5; all other iOS device users can skip to step 6.
iPad users: locate Bebo on iPad. Bebo is primarily designed for phones, which makes the location of the Bebo application on an iPad a bit confusing. An extra step is needed to find the correct application. Launch the App Store and perform your search. You will come up with only one incorrect result. As shown, choose the drop-down menu located in the top left corner of the App Store and choose iPhone only. The correct application, along with a bunch of other results will populate. iPhone, iPod, and iPad users: install the app on iPhone/iPod and iPad. 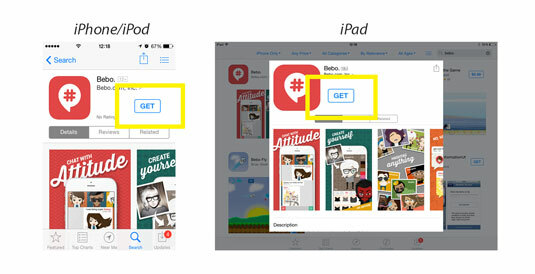 Tap the Get button, and the app will ask for your Apple ID password to confirm the download. Enter your credentials and download the application. After Bebo automatically installs, launch the app from your home screen and have fun!